It was a dominating performance from the Sokamora team who kept their opponents constantly on the back foot to maintain their advantage in the game. Three (3) goals from Joses Nawo helped Sokamora to their convincing victory. Ian Ngahu scored only 1 but he was the biggest contributor to the victory. Kluivert Dagi scored Sokamora’s fifth goal. Northern United played gallantly but they could not manage against Sokamora who were determined to make it into the history books. 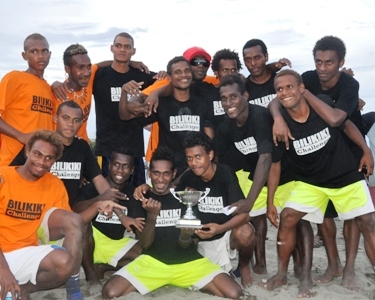 The successful conclusion of the 3-day Bilikiki Challenge was bitter sweet for the organizers since the 2 main teams in the championship, Slide Bilikiki and Fly Bilikiki, both selected from the national beach soccer team players, could not make it to the grand final. Despite the inclusion of James Naka in the Fly Bilikiki team, the best finish from the national beach soccer select teams was fourth place.